Today Access is participating in informal interactive consultations on the World Summit on the Information Society “WSIS+10” review. The consultations are taking place during the UN General Assembly, and are organized by the President of the 69th session of the assembly. They are supported by UN DESA, ITU, UNCTAD, UNESCO, and UN-NGLS. The consultations provide an important opportunity for stakeholders in the information society to exchange views on the outcomes of the World Summit on the Information Society. 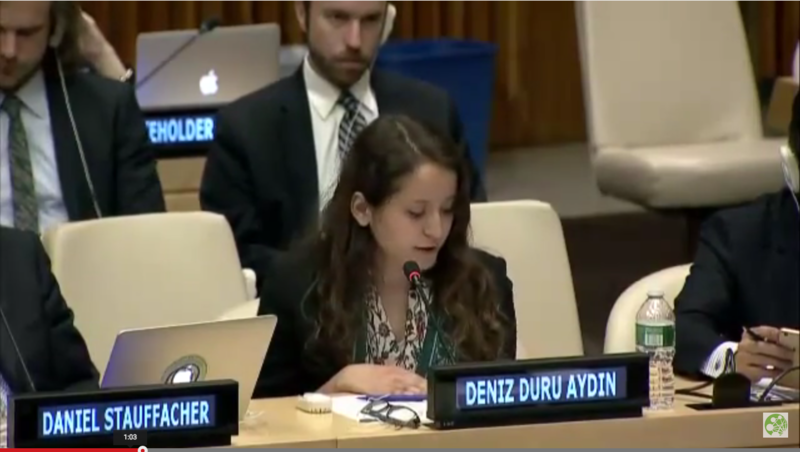 I would like to start by thanking the President of the General Assembly for organizing this consultation, and as a young internet user from Turkey, I am grateful for this opportunity to voice my opinions. I am here today representing Access, an international human rights organization whose mission is to defend and extend the digital rights of users at risk around the world. We believe that a review of the progress made on the vision of a people-centered, inclusive, and development-oriented information society since WSIS must take into account how human rights online have been advanced — as well as put at risk — over the last ten years. The internet is critical for the enjoyment of fundamental human rights. Three years ago, when the Human Rights Council passed its landmark resolution, the international community affirmed that “the same rights that people have offline must also be protected online.” Now, we are at a pivotal moment where the internet has become central to our capacity to enjoy our human rights, both online and offline. We must rise to this opportunity. However, as a member of a global civil society organization and a Turkish activist, I become aware — nearly on a daily basis — of the challenges faced by grassroots groups, journalists, and human rights defenders around the world, as they use digital communication technologies to exercise fundamental rights, including freedom of expression and association. Unlawful surveillance by government authorities undermines the security of our communications, turns citizens into suspects, and imposes chilling effects on expression. Participation in the information society diminishes when individuals cannot trust that their data — whether it holds financial and health information or details about their political beliefs — will be protected online. Any interference with the right to privacy must be strictly necessary and proportionate, prescribed by law, and undertaken in pursuit of a legitimate aim. Governments have the duty to protect our rights to privacy, freedom of expression, and association, online and offline. Despite their promises and plans for action seeking to build confidence and security in the use of ICTs, in the past ten years we have seen states at times failing to ensure that laws, regulations, activities, and powers related to communications surveillance adhere to international human rights law and standards. Likewise, state restrictions on expression online often do not respect international standards. Unfortunately, beyond filtering content online, several governments have even used internet “kill switches” during times of social unrest or protest. These practices can never be justified under human rights law. We believe that the ongoing focus in cybersecurity policy making on “critical infrastructure” fails to consider the risks that people face in our current digital environment. These include malware or cyber-attacks that target vulnerable users around the world — such as journalists, bloggers, and human rights defenders — while harming the security of the network as a whole. A paradigm shift is needed, to put the security of the user first and build upward through the different layers of the internet architecture. We hope to see member states take into account users’ rights and priorities while engaging in new cybersecurity initiatives to build a more open and secure internet. When it comes to access and bridging the digital divide, we believe that there have been effective multi-stakeholder initiatives — from the promotion of internet exchange points, to the ongoing efforts of international organizations such at the ITU and others to promote North­-South and South-­South knowledge and technology transfer. We also support new initiatives and funding structures to connect the remaining 57% of the world’s population. But we should ensure access for all the world’s people to the internet without discrimination or interference, safeguarded by the principle of Net Neutrality. This requires that the internet be maintained as an open platform on which network providers treat all content, applications, and services equally, without discrimination. Therefore, practices such as zero rating raise serious human right concerns, because offering only selected services for free, instead of the whole internet, limits users’ access to selected platforms and content, and creates barriers to local content creation and innovation. Not only should states be obligated to fulfill these commitments — but it is only via such efforts that we can together achieve the vision of an information society where individuals, communities, and peoples can reach their full potential.